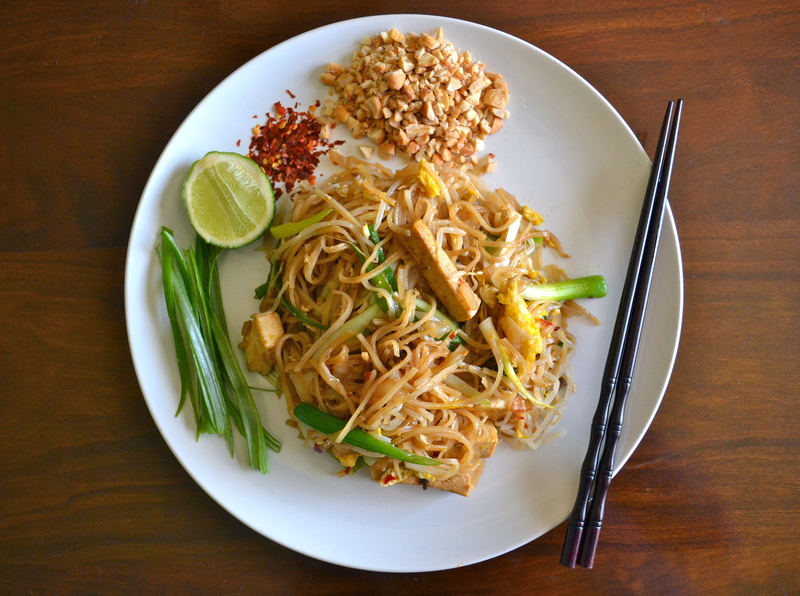 I’ve been researching authentic pad thai recipes and thinking how I could do a tasty vegetarian version. This was delicious, fun to cook and I learned a lot. I’m adding it to the success folder and next time I’ll make sure it’s even better, if not perfect. This morning I picked up a few missing items—tamarind, bean sprouts and tofu, but it was only when I started prepping that I realized I’d forgotten the preserved daikon radish and I only had green onions, not garlic chives. Dang it! I made it anyway. I mean, what? Give up? There’s always tomorrow for perfection. For the real thing, I highly recommend this youtube series Hot Thai Kitchen pad thai episode. Also the High Heel Gourmet has a fantastic blog on real Thai cooking and helpful information for the noobs out there (me included). 1) Gently heat up the soy sauce till warm and add the dried mushrooms. Turn off heat and let mushrooms soak in the soy sauce. 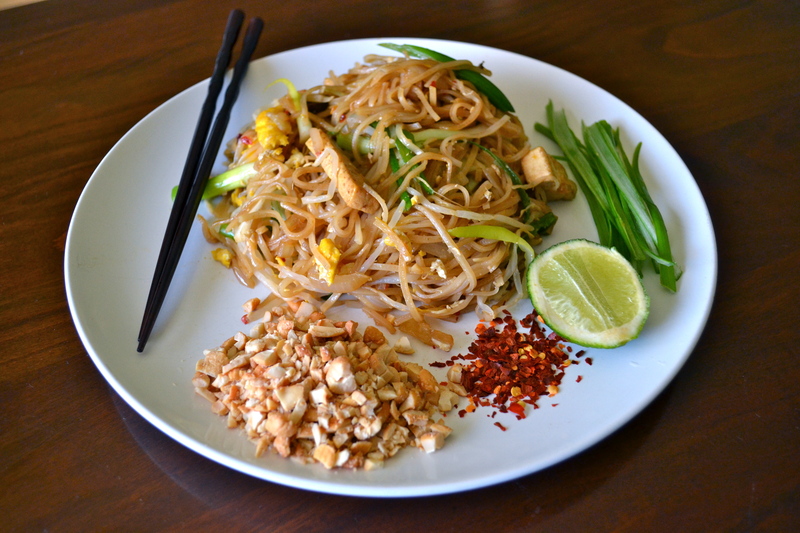 My thinking was to add a bit extra umami flavor to the sauce as real pad thai has the vital salty flavor of fish sauce and dried shrimp. After 20 minutes, strain the mushrooms out and set aside to use later. Skip the mushrooms if you like and move on to step 2. 2) Gently melt the palm sugar with the soy sauce and tamarind sauce. Do not boil. As soon as sugar has been incorporated turn off the heat and set the sauce aside. This recipe makes a fair portion of sauce so store the rest in a jar in the fridge for future use. Mushrooms from the sauce (see above), strained and chopped. 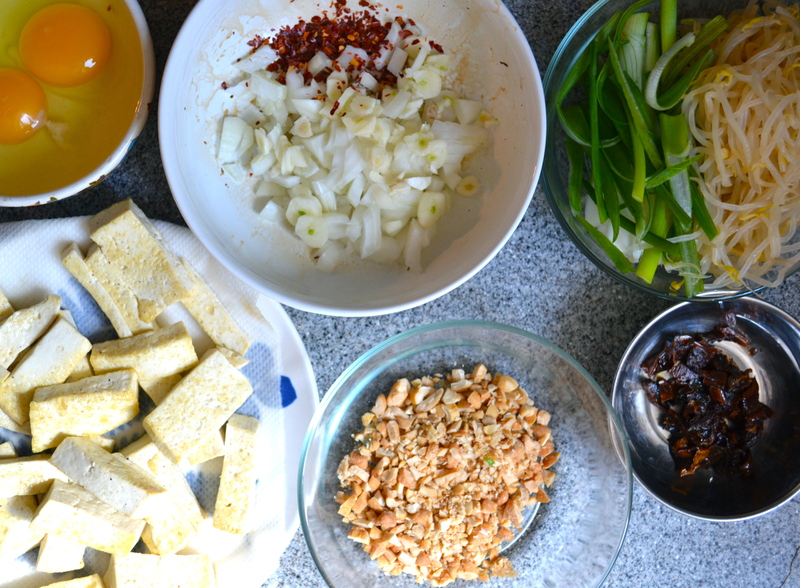 1) Soak the noodles in water for about an hour and prep everything else. Strain the noodles when soft. Cut them with scissors if they are too long. 2) If you do not have the pressed tofu, cut the extra firm tofu into small blocks and fry a couple minutes in oil to crisp up. 3) When the noodles and sauce are ready, heat up 2-3 tbs of oil in a large wok and add the chopped shallot, garlic, and chili flakes and cook for a minute or two on med to med-low heat, stirring. 4) Next add the tofu, mushrooms and radish. Stir and cook another few minutes. 5) Add the noodles, about 4-5 tbs of pad thai sauce and a little water. This is a dry noodle dish but a little water is needed to finish cooking the noodles in the wok. 6) When the noodles are cooked and chewy (NOT mushy), push everything to the side, add a tsp of oil to the wok and drop in the two eggs. Break the yolks and give a slight stir. 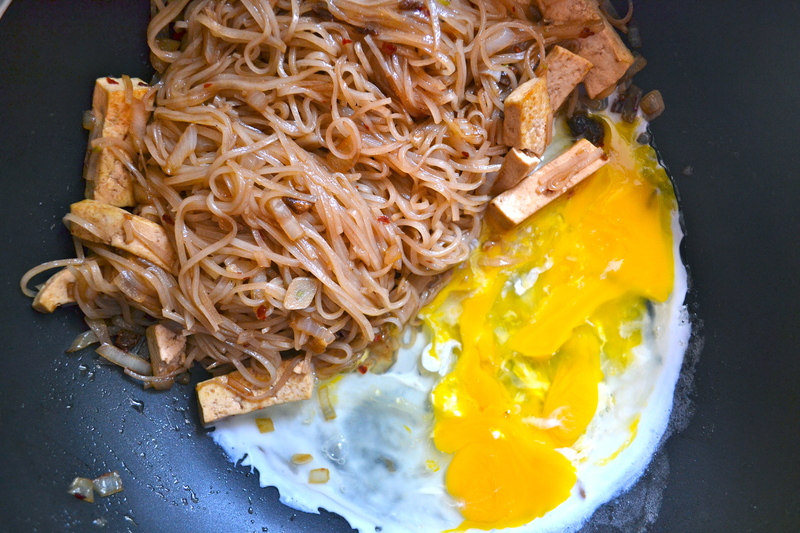 Let the eggs cook for about 30 seconds and then scoop the noodle mixture on top of them. Let cook a little bit and then use a spatula or tongs to mix everything together. 7) Add the bean sprouts and garlic chives and stir fry another minute. 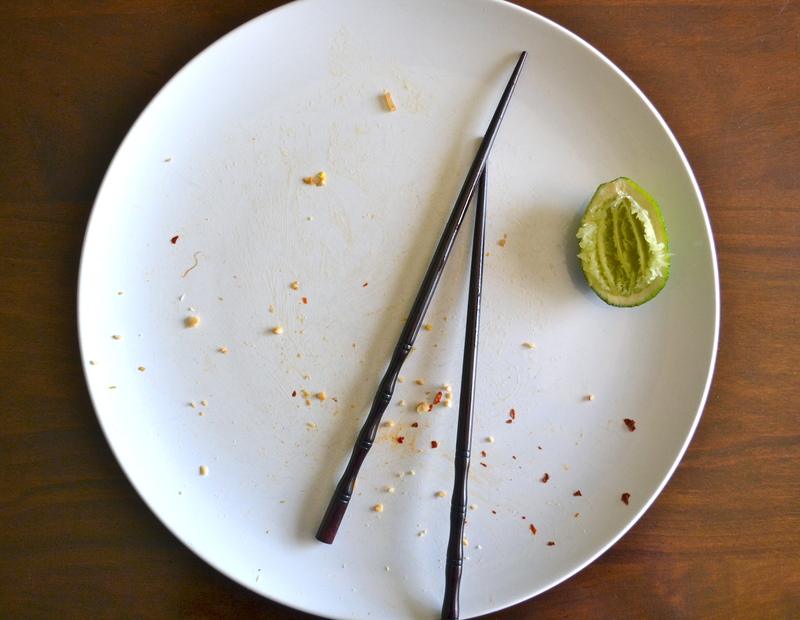 Serve with extra garlic chives, bean sprouts, crushed peanuts (or cashews in my case), red chili flakes, cilantro and a piece of lime. Do not cut a wedge of lime as you would for a cocktail, but cut off a piece of it from the side. It is easier to squeeze and you get more lime that way. Also it’s traditional! The presentation looks better than the one I made. Did you whisk your eggs before you add it? I didn’t. I only broke the yolks, let them half cook in the wok and then mixed them with the noodles and veggies.